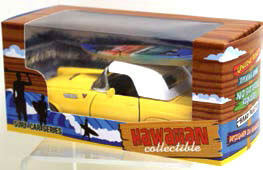 Fulfill your passion for model cars with our line of Hawaiian Surf Cars. All models have a 4” Airbrushed surfboards attached. You can even display them in your shelves with the car doors open. It also comes with an attractive display box.